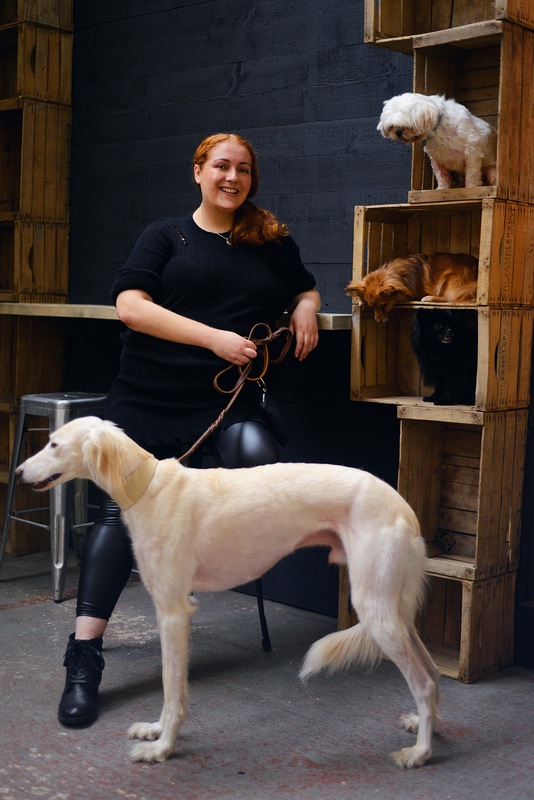 As part of a new series feature we are doing, we want to highlight City Dog Owners and their dog related businesses. These people have dedicated a huge part of their life not just to their pets, but to bringing products to fellow city pet owners to help improve their life and that of their dog. Being an entrepreneur is difficult given the best of circumstances. With expensive rents, small spaces and limited transport options, our featured entrepreneurs have carved a name for themselves with savvy business skills and with their city pups by their side. In this installment of our Dogpreneur feature, we’d like to introduce you to Holly and Teddy from Teddy Maximus. Hello there! Thank you giving us this interview. Please could you introduce yourself? Hi, my name is Holly and I’m the founder of Teddy Maximus, based in Fulham, London. I have always had a love for all things beautiful and girly – accessories, clothes, art and especially dachshunds! My weekends are often spent in the great parks of London with my dog Teddy. We love the cute cafes of Primrose Hill – which I’ve coined as ‘the homeland of sausage dogs, cupcakes and bike baskets’. We recently launched Teddy Maximus with the aim of creating a beautiful British brand that people can induldge in for dog owners of many breeds, from cocker spaniels to chihuahuas. It’s something that i’ve wanted to do for a long time. Everyone remembers that first moment when you bring a dog home, the excitement, the anticipation and the wonderful thought that this little friend is now a special part of your family. Unwrapping a present for your companion should feel great, something that you can treasure and really enjoy using as part of those special moments. I can’t think of anything nicer than being a part of those memories. 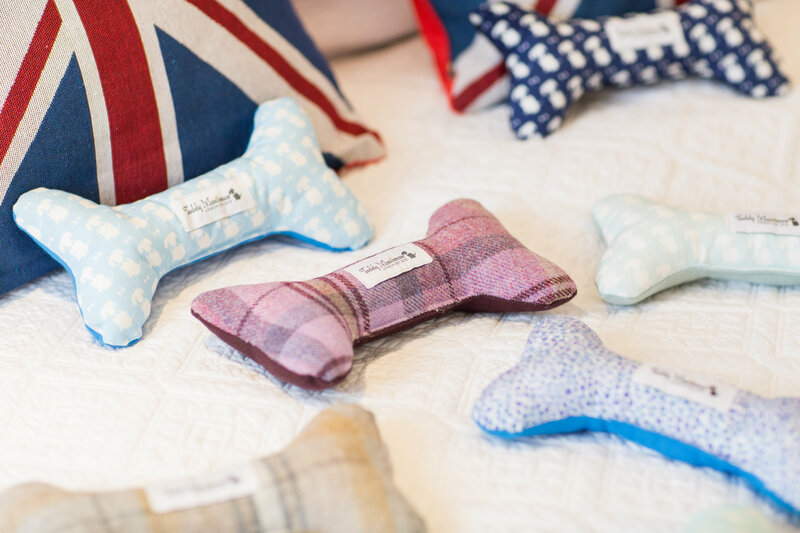 Teddy Maximus is a very British company, we are all about fun, stylish design for you and your dog! We have a motto, it has to make you go ‘ooo’ or ‘aaah’ and it definitely has to make you smile! If it doesn’t pass these important tests with many a discerning dog owner then you won’t see it here! We make luxury dog accessories with only the best materials. From brass collar fittings made in a foundry in England to cushions, beds and carriers made with a lot of love in the heart of the English countryside. Heritage is at the heart of everything we do. Teddy Maximus is a very special little dachshund, Maximus in name and Maximus in nature! He inspired the brand. He always makes people smile and that is such an awesome thing when you walk down the road! I truly believe dogs have a special capacity to have a very soothing effect on people and can make a real difference to someone’s day. 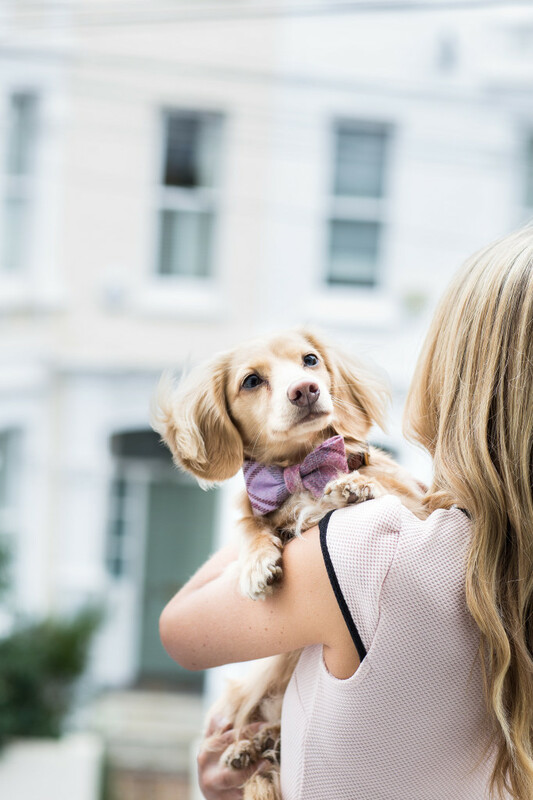 Teddy’s favourite past times include chasing squirrels through Primrose Hill, keeping up to date with his friends on instagram and perusing the Sunday Times Style magazine. What inspired you to come up with Teddy Maximus? My love of dogs, accessories and fashion! I wanted to create a lifestyle brand which people could really enjoy and truly picture in their home. My aim was to create a brand with genuine character and warmth, bringing to life the insights I’ve learnt as a dog owner. I think there is a real resurgence in the appreciation for quality, heritage design, with people prepared to pay a little more for something which has been made with a lot of love and thought and which fits into their lifestyle. When did you begin designing? I began working with a number of talented people early this year, from sourcing manufacturers, to suppliers and everything else in between! With so many beautiful colours, designs and fabric possibilities, the hardest part was narrowing down what I wanted to launch with. It’s been an incredible journey which recently culminated in our first photoshoot in London for our lookbook. I spent weeks searching for the perfect locations and found a beautiful pink door in Knightsbridge which was the perfect back drop to the pastel colours of our signature print. Tell us about the products you offer. We cater for dogs of many shapes and sizes. 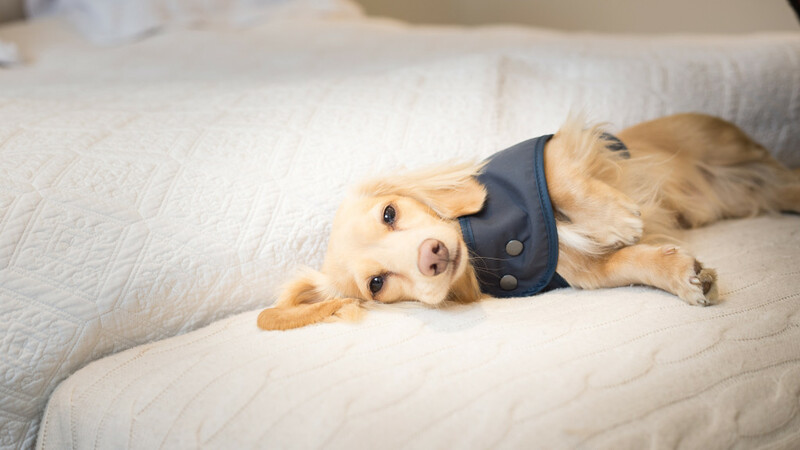 From luxury slumber beds, dog bed cushions, cocoon beds, carriers, luxury leather leads and collars, dog bone toys, bow ties, dog bone toys and coats! 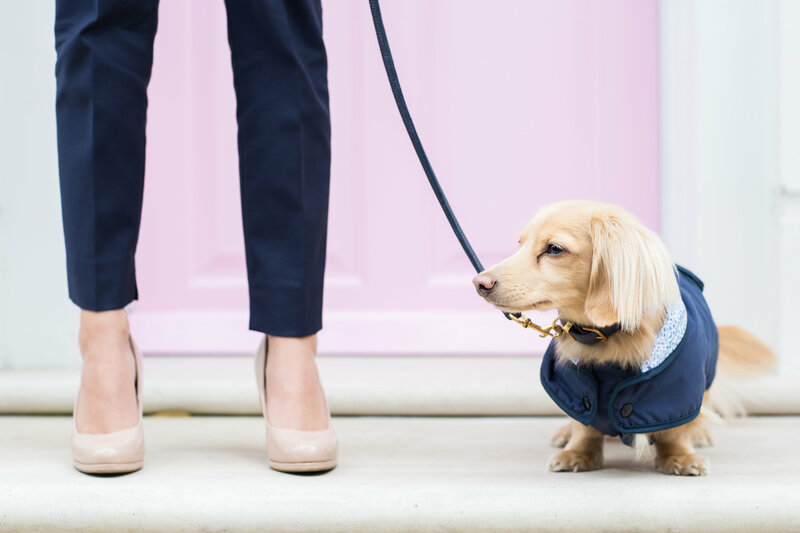 We do coats in 6 sizes, including a special one just in dachshund proportions! 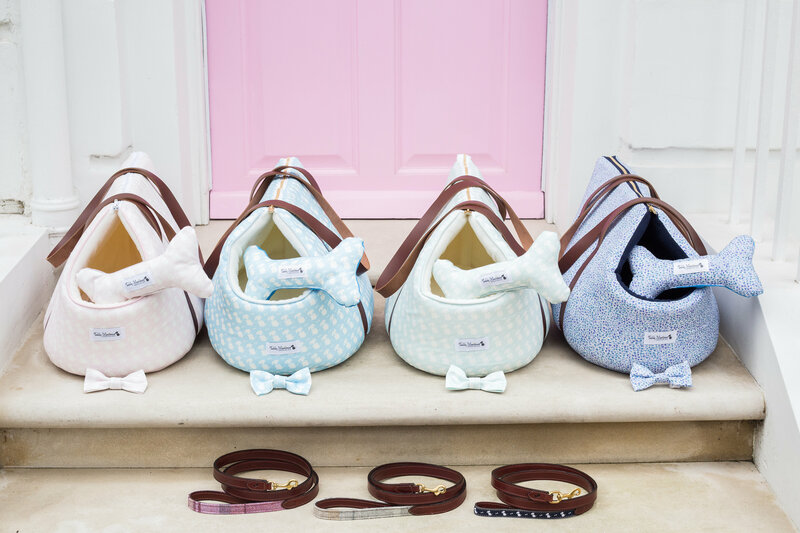 Our bow ties and carriers have been particularly popular, people really like the fact that you can buy matching items. 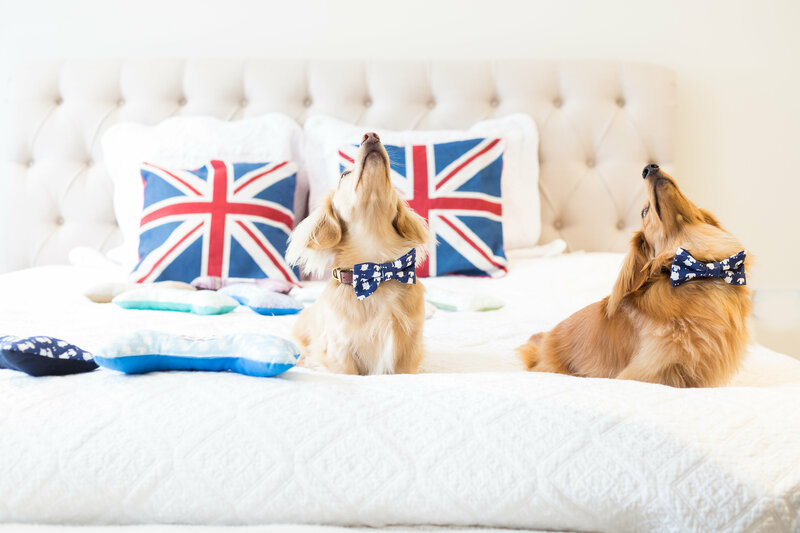 We have launched with three collections, our signature print collection featuring our dog motif with tiled head and bow tie, a Shetland wool collection and a quintessentially British Liberty print collection. How does your Teddy Maximus carrier benefit city dog owners? Being a city dog owner, I’ve toiled the tube, buses and busy streets so know what it’s like to have your arms full and not much space! When having a small dog that’s so low to the ground you appreciate how vulnerable their little paws can be when lots of busy human feet are pounding the streets! After a long day in the city, dogs can also get pretty tired! When Teddy decides he’s had enough, nothing in the world will get him moving again! The luxury carrier is a really snug way of travelling, helping to put your mind at ease. People also love them for their little dogs in the house. Our Liberty print carrier was recently bought as a snuggly bed and is left open all day on the floor in the lounge, we love this idea! The carrier comes with a trigger hook to attach to your dog’s collar or harness, leather straps and a pocket for bags or treats! There is also a removable cushion. Sounds like they are stylish and perfect for city canines. Thank you! They have been really popular! It’s really exciting to see people enjoying the brand. For everyday inspiration, I love people watching from a great café with a mug of hot chocolate and BIG slice of cake, there are some great stylish people walking around London with their pooches! For design, style and culture, I really LOVE the special exhibitions at the V&A, one of my first was a Vivienne Westwood exhibition that my parents took me to see, and one of my recent favs is probably the Made in Britain exhibition. What is the future for Teddy Maximus? Well we have our first Teddy Maximus wedding this Christmas, with one of our bow ties being worn by the bride and groom’s dog, that for me will be a really exciting moment! We have a partnership with the Dogs Trust, so for every dog bone toy bought online from teddymaximus.com we donate £1 – so we hope to grow that to enable lots more dogs to enjoy a safe and happy home. We’ve had some incredible feedback and many people are coming to us with specific requests and ideas for extending the lines so watch this space! Thank you for sharing your story with us, Holly and Teddy, and we wish you all the best for the future. Want to try something from the amazing ted max collection? Use this discount code for 15% off CITY15. Offer expires 26th December. What beautiful and fashionable products! Any dog would love them. Teddy Maximus is SO cute!! That was a great interview and they have some neat stuff! sounds like a fun line! Wow, these look like great products! The picture with the dogs wearing bowties is darling! And I like the bed patterns. I want a mug of hot chocolate and a BIG slice of cake! ☺ What beautiful photos and products! So posh! Those carriers are the coolest I believe I’ve ever seen. My corgis wouldn’t fit, but my cats would (don’t think they’d stay in there, though). What fun products and amazing photos! Gorgeous. And, now, I want to go back to London. Thanks so much Kristen! We are all about fun, luxury British style. 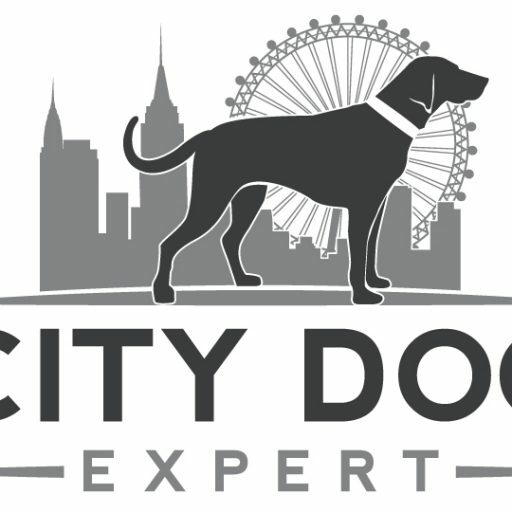 We can keep you updated with your daily dose of London through our instagram, facebook and twitter and obvs through the amazing City Dog Expert 😉 x oh p.s we also deliver to the US! These are some very beautiful products! It looks like Teddy Maximus uses high-quality materials too. I really like the dog purses. Wow – what a beautiful line! Hi Kelsie – great to hear your comments! So glad you like it! All our products have been really carefully designed and made in England with alot of love. Great fashion-themed piece! I think these items look very pawesome and dey sound great too! A super looking brand, Pepe and I will be trying out some of their lovely products very soon! Gorgeous products!! Congrats on your success. Hope it continues. Beautiful Products. They look very fashionable. Love these. Wish my pups would fit into those carriers. 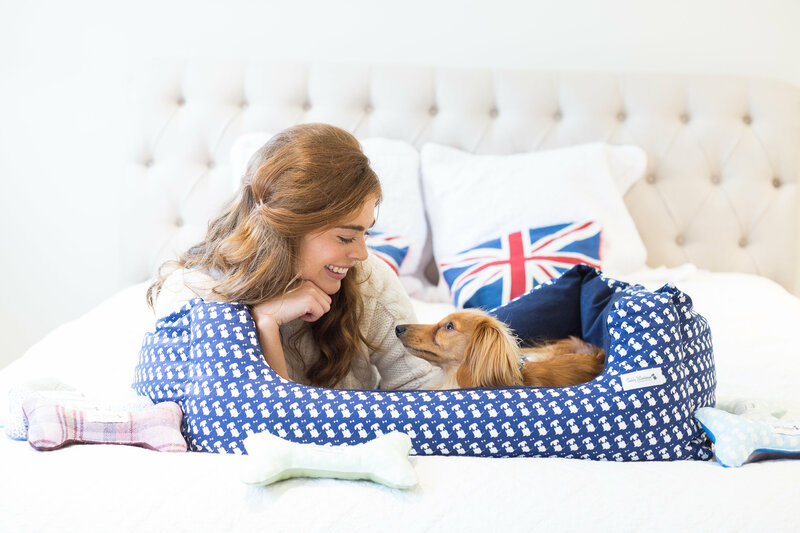 Beautiful products, photos and the pup models are pretty darn cute too! Wonderful interview, I can see that Teddy Maximus is a real quality company. And Teddy is adorable!! Great interview and those look like some wonderful products for dogs. Those are some lovely products! Are they sold in the US as well? Great name, great looking items! If I still lived in London, I’d be in the shop =) I’m going to do the next best thing and visit the site. Thanks for highlighting this business.